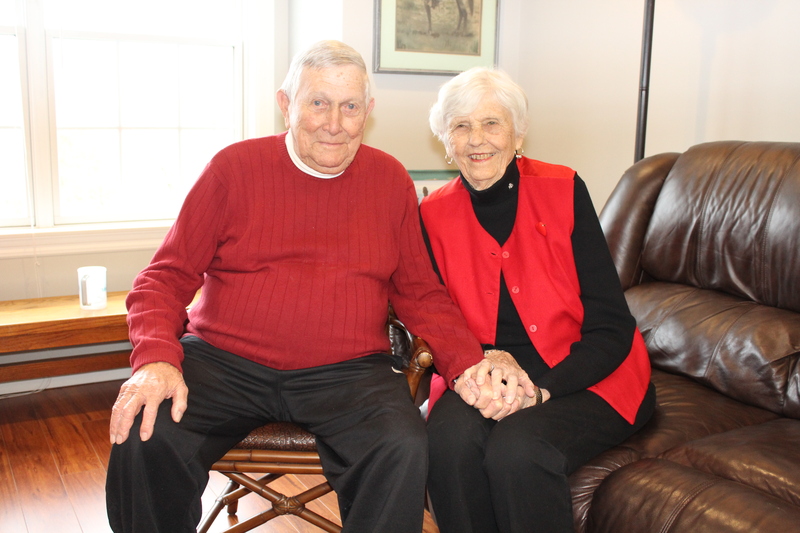 Sitting in their apartment at Bethesda Gardens on Valentine’s Day, Don and Margy Patterson recalled the day they met in 1950. Not exactly love at first sight. They were at a church event called Teen Town, where kids and young people gathered and listened to music. Don was 19; Margy was 16. Both were with a group of friends. Later that night, the dates were arranged. That is, Don lined up a date for himself with a different girl, and arranged for one of his friends to go out with Margy. “I don’t think I was happy,” recalls Margy. Don had second thoughts soon afterward. “He called me, and I remember him saying that perhaps we could trade dates,” says Margy. Unfortunately for Don, the guy Margy was slated to date didn’t want to trade. Eventually, they did date, of course, and fell in love. However, their relationship disrupted Margy’s parents’ plan of having her attend college – Don had joined the Army’s 82nd Airborne Division and was stationed at Ft. Bragg, North Carolina, while Margy was still in St. Louis. “We were pining for each other,” she says. Her parents bowed to the inevitable. They were married on June 28, 1952, in Kirkwood. “Her parents gave us a great wedding,” says Don. Out of the Army, the Pattersons moved to Kirkwood, Missouri. Don worked at the local Chevy dealership for 30 years. They raised four children, have 10 grandchildren, and are expecting their 20th great-grandchild in March. Opposites may attract, but Don and Margy believe they are very similar. According to Margy, Don could build anything, including a cabin he constructed on top of a steel boat hull. They bought a lot on the Lake of Ozarks and decided to haul the boat to their lot on a hot summer’s day. There were two children in the back seat of their old convertible. Margy, who was pregnant, was in the front seat. They drove west on U.S. Route 50, a hilly, winding, two-lane road. “We were going really slow, and the people driving behind us were mad and said things to us as they passed,” Margy says. Then the convertible’s roof blew off the car. “It was like 100 degrees, and we had these small children we had to protect,” says Margy. They retrieved the roof and put it back on top of the car. Margy held it in place with her hands as they drove on. Margy and Don are sure of each other and the life they have chosen together. The idea of getting married never made them nervous. “We just knew it was going to be wonderful,” says Margy. However, they are realistic about marriage. “If you ever think you’re not going to get into a disagreement, you might as well forget it,” Don says, as Margy nods in agreement. Happy Valentine’s Day from Bethesda Health Group! There’s always something exciting going on at Bethesda senior living communities in the St. Louis area. Find more resident stories on our blog.